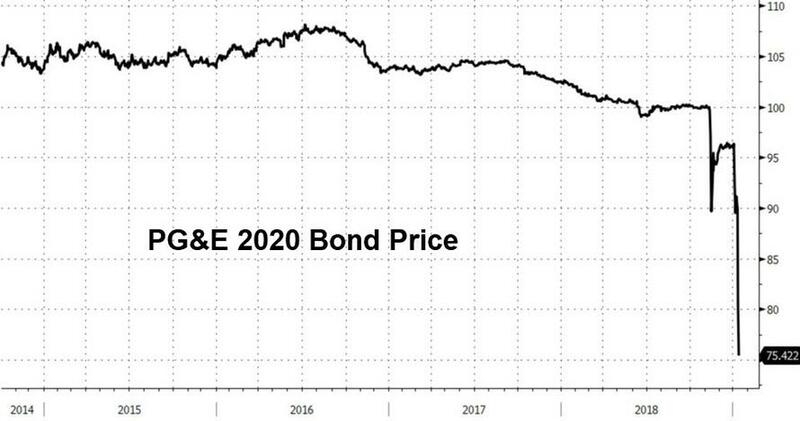 PG&E bonds are crashing and its stock just hit a new record low after the company opted not to make an interest payment today on its $800m of 5.4% bonds due Jan. 15, 2040, triggering a 30-day grace period on the note, according to data compiled by Bloomberg. If PG&E goes bankrupt as expected, it will be the first investment-grade name to default without entering the U.S. high-yield market since MF Global in 2011, Bank of America strategists led by Hans Mikkelsen said in a note. Additionally, PG&E would be third largest IG default since 1999. 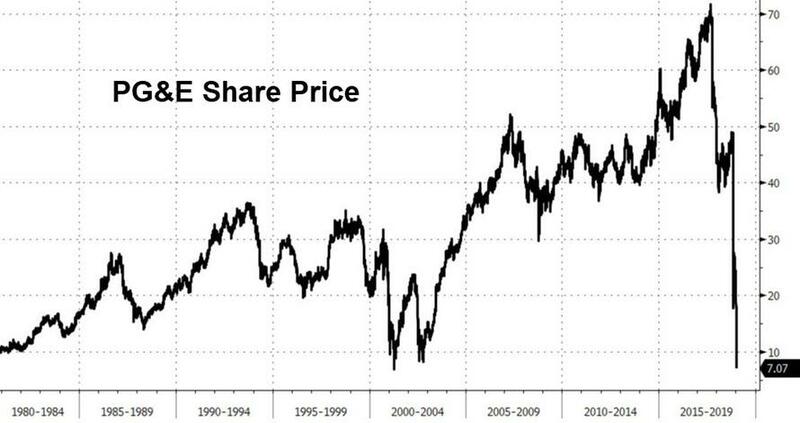 Its $17.5b of index-eligible debt puts it behind Lehman ($34.9b) and Worldcom ($22.9b). As Bloomberg reports, the filing, viewed by some as the worst outcome, may actually help California decide what type of utility is right for a state with an ever-increasing risk of multibillion-dollar wildfires, according to Severin Borenstein, an energy economist at the University of California, Berkeley. Options such as breaking up the utility giant or turning it into government-owned entities are likely to be hashed out in concert with the bankruptcy proceeding, he said. “It will accelerate the discussion that was being had before bankruptcy, which is what is the appropriate structure of utilities given the increased wildfire risk?” Borenstein said. So far, California Governor Gavin Newsom and other lawmakers showed little interest in bailing out the beleaguered company.